A Dual Monitor KVM is a hardware device which can be used to switch input from keyboard & mouse cursor & output to Dual Monitors between Dual Computers. So you connect Keyboard, Mouse & Dual Monitors to the Dual Monitor KVM Switch & the you connect two CPU’s to the switch. The KVM switch may provide a button or some pre configred keyboard command to switch between computers. 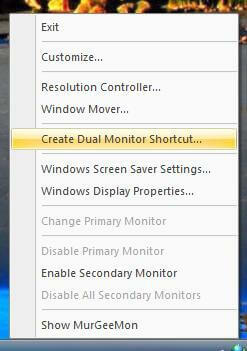 When done with installing & configuring the Dual Monitor KVM with one Mouse Cursor, one Keyboard, two CPU’s and two Monitors, you will be able to work on any of Computer’s CPU at a time with dual monitors. The KVM switch may allow Windows only, UNIX only or both platforms for the type of CPU’s that can be connected to the Dual Monitor KVM. With the Dual Monitor KVM switch installed, you can be working on Dual Monitors at your Desk and switching between UNIX and Windows Machines.